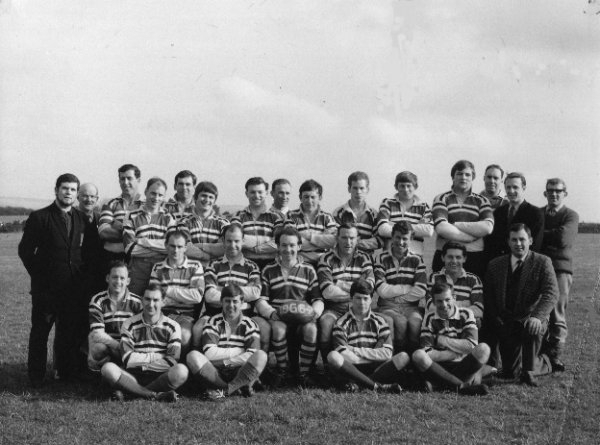 By the mid 1960s Plymouth Argaum had established themselves as one of the leading junior sides in the region, regularly running 3 Senior Saturday sides, 2 colts sides and even a Wednesday team, The Barbarians. This was a time long before leagues and therefore fixtures were arranged against traditional opponents based on whether clubs were deemed to have 'senior' or 'junior' status. Despite Argaum's success during this period the fixture secretary were frustrated with not being able to obtain fixtures against some of the better teams in Devon. This grew to such an extent that the club even applied to join the Cornwall RFU where it was perceived that fixtures were drawn up more on merit and results rather than tradition. The application was turned down however, before the start of the 1966-67 season, which saw Argaum continue their good from by winning the first 8 matches of the season. Bill Ryan, who went on to establish the club at Saltash, of which he is now President, was 1st XV captain, whilst Rip Kirby returned from a brief spell at Plymouth Albion to operate at scrum-half. John Ellis and Tony Blonden were other prominent members of the backs behind a pack that contained Barry Rees, Peter Green and a prolific back row of John Price, Fred Rogers and Frank Lavis. By the time they travelled to The Recreation Ground at the end of January they had a record of 16 wins, 2 draws and 4 defeats which included victories over the likes of Brixham and Launceston. Camborne have always been one of Cornwall's leading clubs with numerous players representing the county over the years whilst their ground regularly staged important representative matches. Indeed 3 weeks before Argaum's visit, the touring Australians had played a Cornwall & Devon side, running out 11-6 winners. To the match in question then and Camborne missed an early penalty opportunity through Tonkin, after which Argaum's backs showed promise through good handling with Ryan and Blonden both prominent. Camborne pressured the Argaum defence through their pack with Terry Mankee, held up over the line after an excellent effort to score in the corner. Argaum defended stoutly but eventually pressure told as Carter sent Rockett over for an unconverted try to give the Cherry & Whites a 3-nil half time lead. Argaum's prospects look bleaker at the start of the second half when Dave Martin, who had played much of the season on the wing, but was occupying the fly-half berth on this occasion, was badly injured with a suspected broken ankle. This was in the days before replacements were allowed in rugby, the laws were not changed until the 1968-69 season, therefore Argaum were down to 14 men. This appeared to galvanise Argaum's efforts and the back row in particular, with tries coming through Fred Rogers and the previous season's captain, John Price. A conversion was added by the prolific Kirby to give Argaum a famous 8-3 victory. The outcome was viewed differently on opposite sides of the Tamar, with Argaum seeing the result as proof that they could live with a higher standard of opposition, whilst for Camborne it was viewed as something of a disaster losing to a junior club such as Argaum. The Cornish Press whilst launching a scathing attack on the Cherry & Whites did acknowledge however that Argaum were 'a competent side who would not be disgraced in the senior ranks'. The season never quite hit the same heights for Argaum, who had a bit of a mixed bag of results thereafter. Camborne recovered and the following season secured the first victory over Ebbw Vale, who regularly toured Cornwall during Easter. They went on to become the premier side in the County during the 1970s and 1980s and when League Rugby arrived in 1987 where placed in the National Leagues.